Among the announcements Monday from Internet TV network Revision 3 was the discontinuation of its licensing agreement with the popular video podcast, Wine Library TV. Rev3 had produced a special edition of the show featuring highlights of the daily series called Wine Library Reserve. I caught up with the creator and host of Wine Library TV, Gary Vaynerchuk, by phone to ask about his perspective on the cutbacks and layoffs at Revision 3. The Revision 3 staff member who edited the daily Wine Library shows into the network’s highlight Reserve series was laid off, along with a reported eight other employees. Vaynerchuk was surprised by the decision, but not disappointed. 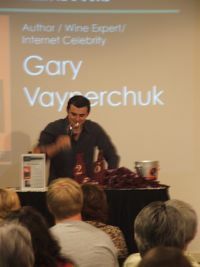 “I’ll come out ahead in the long run.Â I have so many good things on the horizon,” Vaynerchuk says. “I’m working on a cruise for next year. The viewership of Wine Library Reserve was good. Our viewership was not huge there, but I’m absolutely sure we gained some new viewers who didn’t know what Wine Library TV was, from this time we worked with Rev 3. It has been widely reported that the changes at Rev3 were prompted, at least in part, by the recent economic downturn. I asked Vaynerchuk to share how the current climate events affect him, and his advice for other content creators. “I’m taking a hard look at everything I’m doing, getting lean, getting in better shape. I’ve cut a thousand SKU’s from Wine Library inventory lately. An economic downturn makes you re-examine what you’re doing, and that’s a good thing. These kind of decisions are practical, and should be made during good times, too. Gary V is awesome – this is just a speedbump.